When training and exercising is a big part of your life it is so important to nourish through food supporting your nutrition plan. Eating great sources of vegetarian protein helps to re-build muscle making you stronger for your workouts. 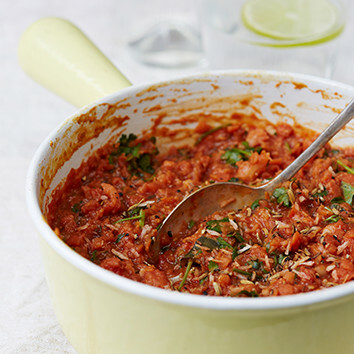 This delicious Beetroot Dhal recipe is full of protein and alkaline ingredients to help cleanse the body. Adding the Beetroot powder to the recipe helps to improve muscle function and stamina. It is amazing how eating the right foods to support an active and busy lifestyle helps to improve our performance and overall wellbeing whereas, eating the wrong foods will leave you feeling tired, exhausted, bloated and lacking in energy. In a frying pan (this is important to use a frying pan not a sauce pan) sauté for 2 minutes with the onion garlic turmeric, spices in the coconut oil and then add ¼ cup water and leave for another 2 minutes, then add lentils. Add 300ml water and simmer for 2 minutes. Next, add 200ml water and butternut squash and cook for 5 minutes. Add the curry leaves, tomatoes and beetroot powder and simmer for a further 5 minutes. To make the optional garnish, put all ingredients into a dry frying pan and leave to toast for 2-3 minutes until the coconut goes golden. Take off heat and sprinkle over the top. Serve with fresh coriander and sliced fresh chilli.